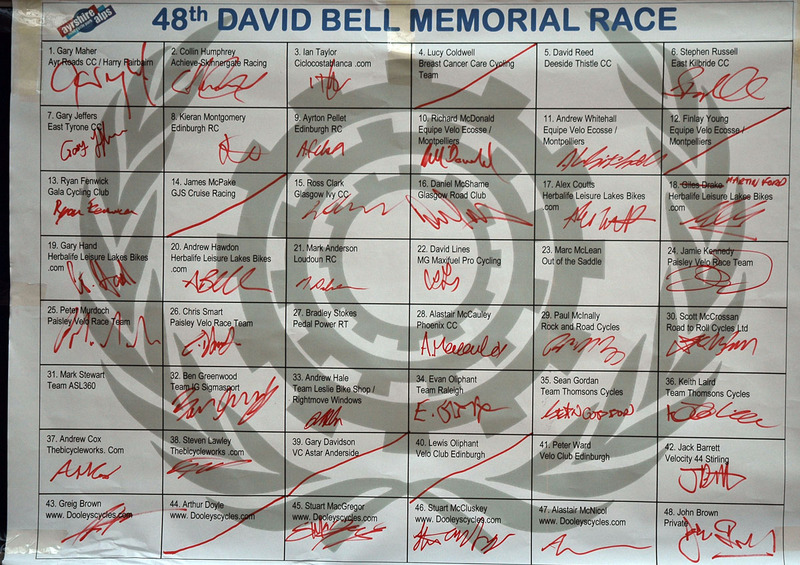 On yet another typical sunny South Ayrshire day 46 riders signed on the 49th David Bell Memorial. Among the pre-race favourites was Commonwealth Games rider James McCallum (NFTO), 2013 Scottish Road Champion Gary Hand (KTM road and trail) and perennial strong man Ben Greenwood (Leslie Bike Shop). Both Hand and McCallum came into the race as former champions, in 2008 and 2011 respectively. With 82 miles of racing in store, and over 6400ft of climbing, it was sure to be a tough day in the saddle. 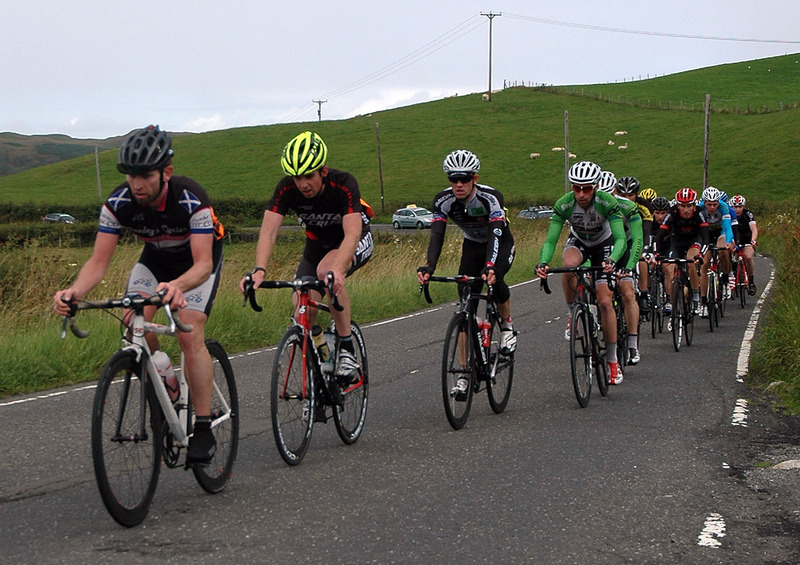 Once again the South Carrick Community put on great hospitality to welcome the riders to the Ayrshire Alps. 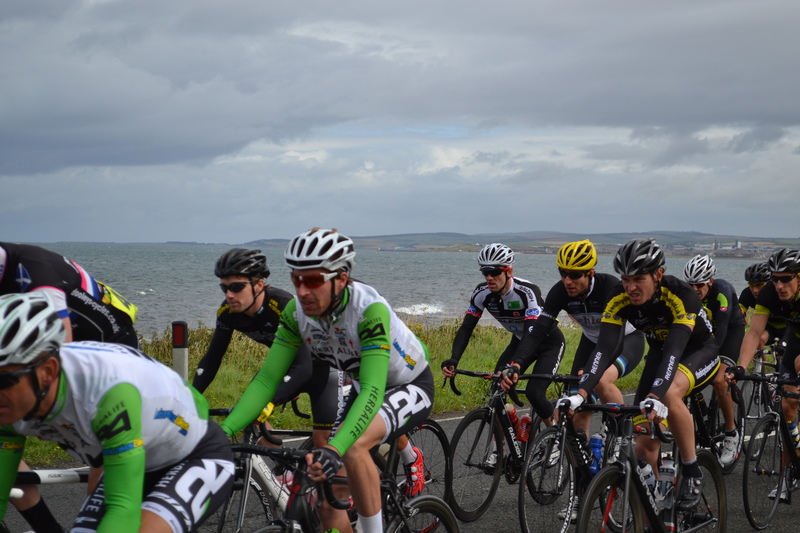 The racing kicked off inVictory Park, Girvan at 13:00, with a neutralised section up the Byne Climb before a long fast descent to Bargreenan, much of which was covered at 40mph! Gary Hand and Peter Murdoch (Paisley Velo) were instrumental in forcing the first move of the day, while a counter attack bridged the gap to create a leading group of 10 on the Glentrool – Tairlaw Road. 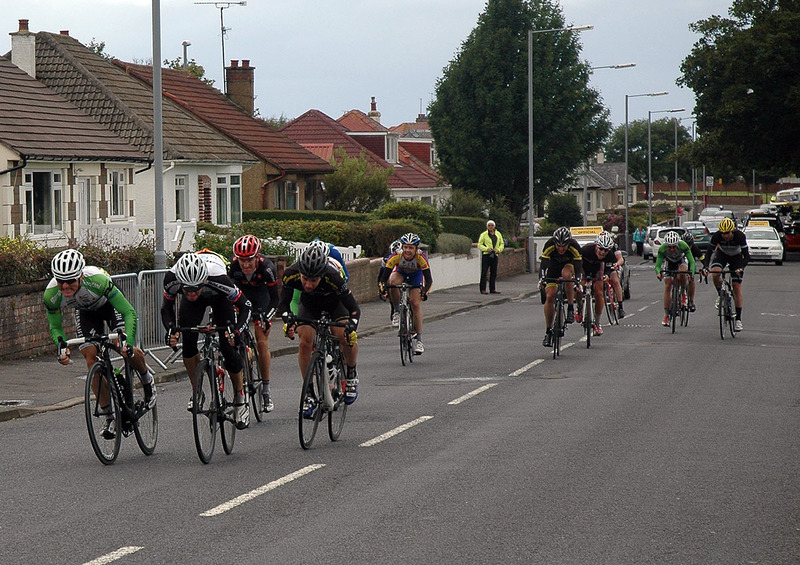 By the time the bunch had reached the Bell Memorial at Rowntree Toll the leaders had a 50second advantage. What was looking fragile, coming down to 46 seconds on the slopes of Tairlaw Shalloch, quickly became a much more establish 1:30 by the time the group hit the Summit. Hand was in dominant form, clearly snatching the prime in front of the assembled cycle spectators out enjoying the sunshine. 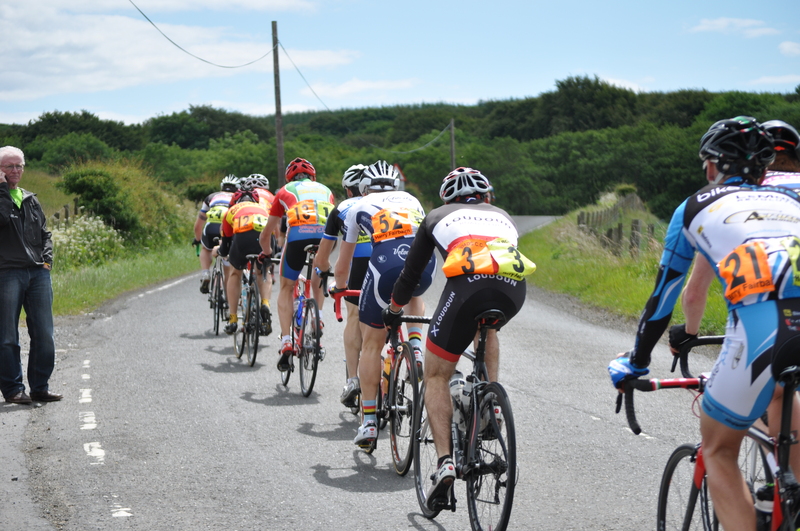 By the time the race reached Glenalla the gap was approaching 2mins for the first time. All was not well in the chasing group as riders struggled to adjust to the gradient and there were clear arguements to be had between the riders on who was going to pick up the chase. Come Barr and the Screws the leaders were now well over four minutes clear – the chase having really lost impetus on the valley floor road. A fast approach through Girvan preceded the final circuit of the Byne – Assel Valley circuit where a number of digs whittled down the group to just 8 riders. Again it was Hand who took top honours on the Byne Prime while McCallum and Murdoch were active protagonists on the descent, but noone get a clear gap until Hand broke away on the run into Victory Park, taking just Andrew Whitehall (Glasgow Wheelers) with him. The rest looked to sprint star McCallum to chase, giving the leading duo an advantage into the uphill sprint finish. After a day long dual it was Gary Hand who got to raise his arms aloft, while McCallum took the sprint for third. A huge thanks from the organising club, Ayr Roads CC, to all the people who supported the event including South Ayrshire Council, all the event convoy team, marshals, first aid and NEG. A huge thanks to John Doig too for kind permission to reuse his photos on the website. Gary Hand wins again after 6 years! 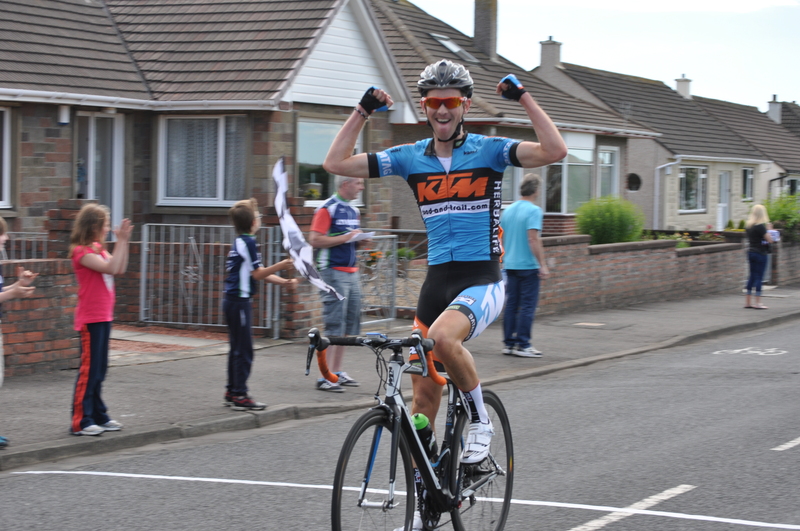 Congratulations to the 2014 winner of the David Bell Memorial Road Race Gary Hand! 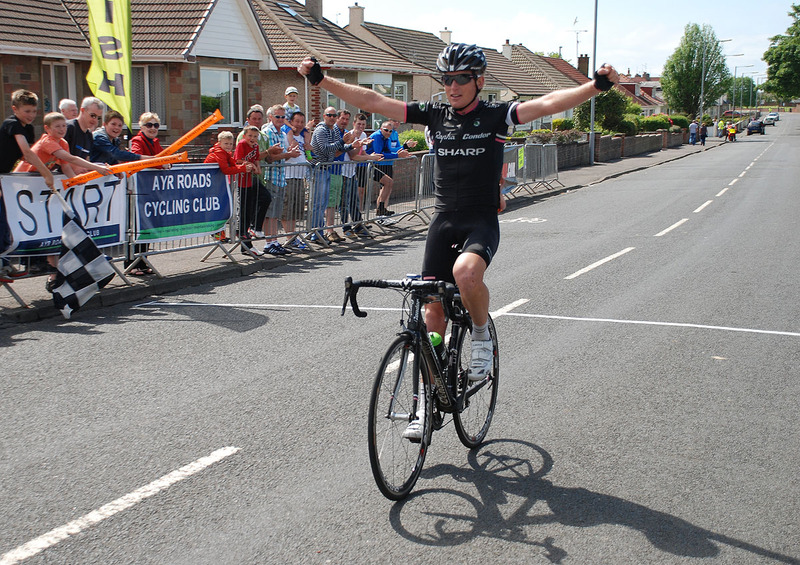 This was Gary’s second win in the classic Scottish road race, having last won in 2008. Gary Hand (KTM Rock and Trail) led a clean sweep of both primes on the ascents of Tairlaw and the Byne, and initiated a late attack from the leading group of 10 to win the 49th edition of the race from Andrew Whitehall (Glasgow Wheelers). James McCallum showed he is still king of the sprints to take a fine third place. A brilliant day of racing – full results and report to follow. 49th Davie Bell Preparation Underway! With less than two months until the 49th edition of the David Bell Memorial Road Race, preparations are well underway. 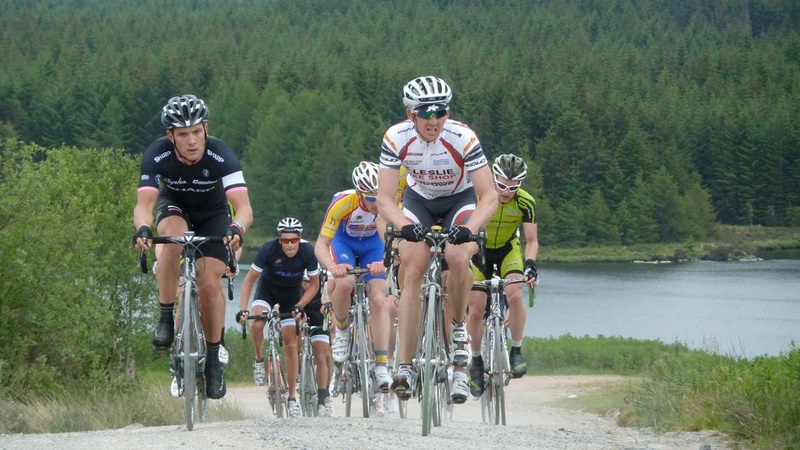 This monument of Scottish Cycling, run around the hill roads of the Ayrshire Alps Cycling Park, will take place on Sunday June 29th from Girvan. The event is supported by South Ayrshire Council and promoted by Ayr Roads Cycling Club. 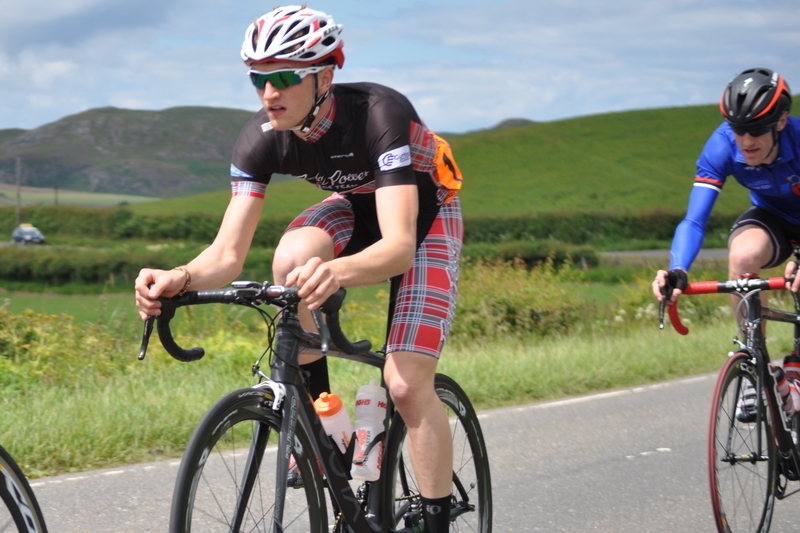 This will be a ‘National B‘ event run as part of the Scottish National Road Race Series with a prize fund of more than £1000, a full race convoy and the same high organisation standard the race has come to be known for. The event is open to Elite, 1st, 2nd and 3rd category riders. This is the race that every Scottish cyclist wants to win, with an incredibly rich history and formidable reputation. With a mix of grueling terrain a top competition, this is not a race for the weak! The 49th edition of the David Bell Memorial Race will be run over a 130km course featuring the ascents of Tairlaw (Shalloch), Hadyard, the Screws and the Byne. 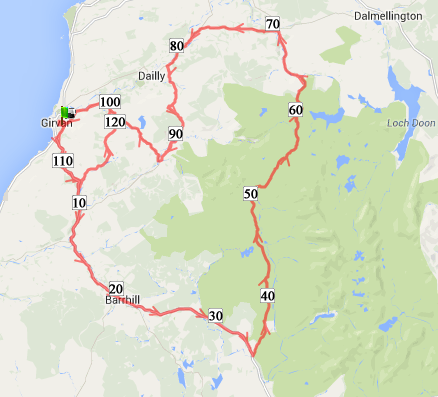 Based in and around Girvan, the race concludes with the now traditional lap of a circuit featuring the Byne and Assel Valley. Known for being a hardman’s race, the 49th edition of the Davie Bell will not buck the trend with over 1400m of ascent. However, with the 2013 edition finishing in a big group sprint the circuit suits the powerful rather than the pure climbers. With the riders passing by Victory Park in Girvan three times this should make for a great spectator friendly race. Add to that the beautiful views by the Bell Memorial at Rowntree Toll and the fabled Ayr Roads post-race spread and we are guaranteed a grand day out. We are pleased to confirm that the David Bell Memorial RR will continue into 2014 as Kenny Armstrong steps into the role of event organiser. Kenny will be supported by a team of club members including Christopher Johnson, who has stepped down as organiser after 3 years to focus on other projects. Third in line, new organiser Kenny Armstrong is no stranger to the Davie Bell! The race is expected to return to its usual June calendar slot (tentatively 22nd June 2014). 2014 will see the 49th edition of the Scottish Monument. Despite its reputation for a fierce parcours, the 2013 edition finished in a 14 -man sprint won by Evan Oliphant. Kenny Armstrong is a familiar face on the Scottish racing circuit, and has considerable event organisation experience already having very successfully headed the organising team for the Scottish Team Time Trial in 2013. Oliphant wins his 3rd edition! When Team Raleigh’s Evan Oliphant signed on in Girvan this morning, few would have bet against him to take the win. However, who would have predicted it would be after a 14 man sprint up South Park Avenue after 81miles of racing including six categorised climbs? The 48th edition of the David Bell Memorial kicked off at 11am with a ceremonial lap of Victory Park before the peloton rolled out of Girvan onto the main coast road and the racing commenced. 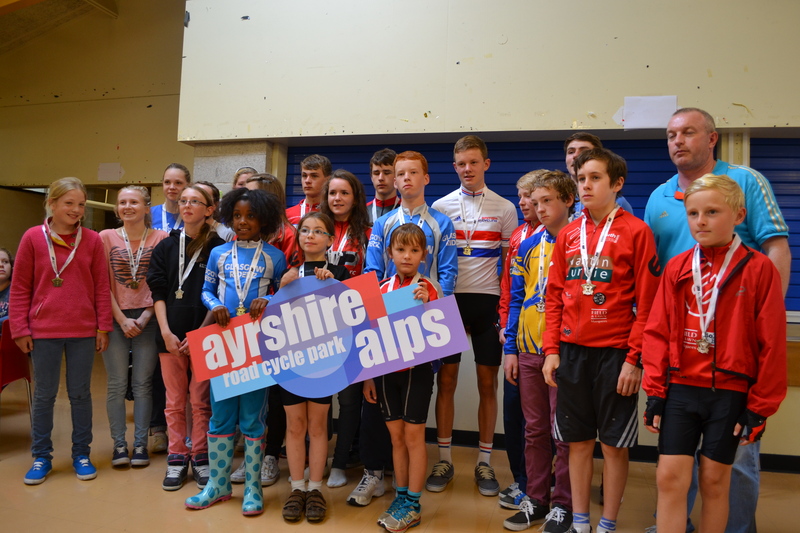 The event was the climax of the Ayrshire Alps Cycling Festival, promoted by Ayr Roads CC and supported by South Ayrshire Council. A number of riders tried to get clear on the run down to Lendalfoot, including Mark Stewart of ASL360. All were shut down by Oliphant who explained he didn’t want a break to get away before the climb of Carleton in case it led to a long chase. Coming at just 7 miles, the steep opening pitches of Carleton forced a split in the group as 15 riders lost contact. Oliphant and Team IG Sigma Sport’s Ben Greenwood summited first, but with over 70 miles to race decided not to press the advantage. The second prime of the day at the Screws saw Oliphant take maximum points again ahead of Hawdon and Greenwood. Under a deluge of rain, David Lines made a daring solo bid, gaining more than 30 seconds on the bunch when the race passed through Girvan for the first of four laps of a touch fourteen mile circuit around the Byne and Tormitchel. 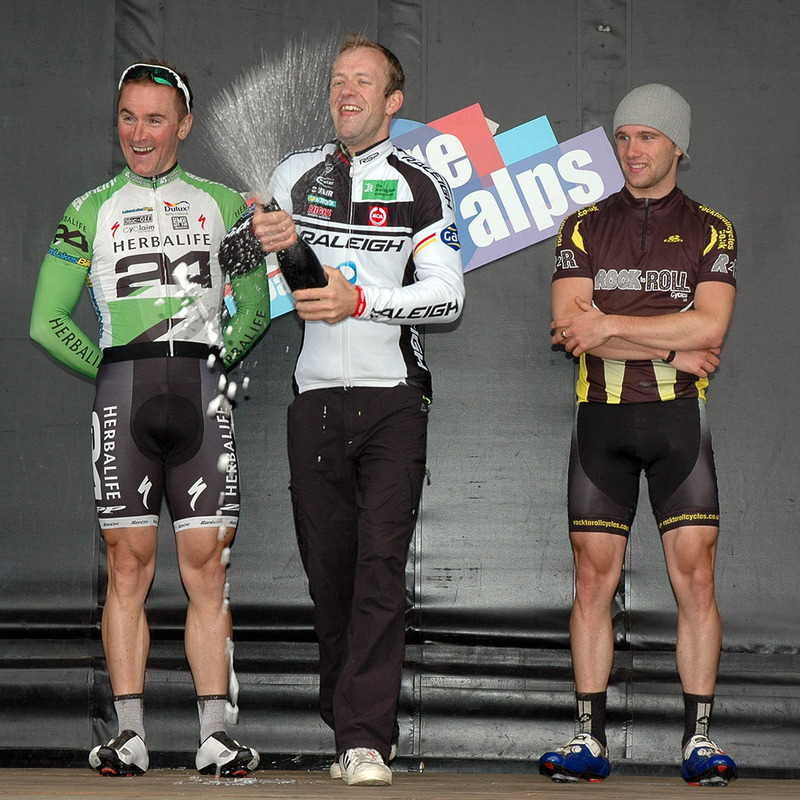 Oliphant secured his victory in the King of the Mountains with a top three finish on the first passage of the Byne. Oliphant consolidates his lead in the DigitalMyWay.com KOM competition on the Screws. A lap later and Lines advantage had been cut to less that 15 seconds. A block headwind climbing the Byne neutralised attacks from the pack behind, but also made for a lonely race for out front. Paisley Velo’s Peter Murdoch bridged over to Lines on the third run through Girvan, and the two managed to extend their lead to maximum 58 seconds. But come the bell lap it was all back together, with everyone expecting fireworks on the last lap. 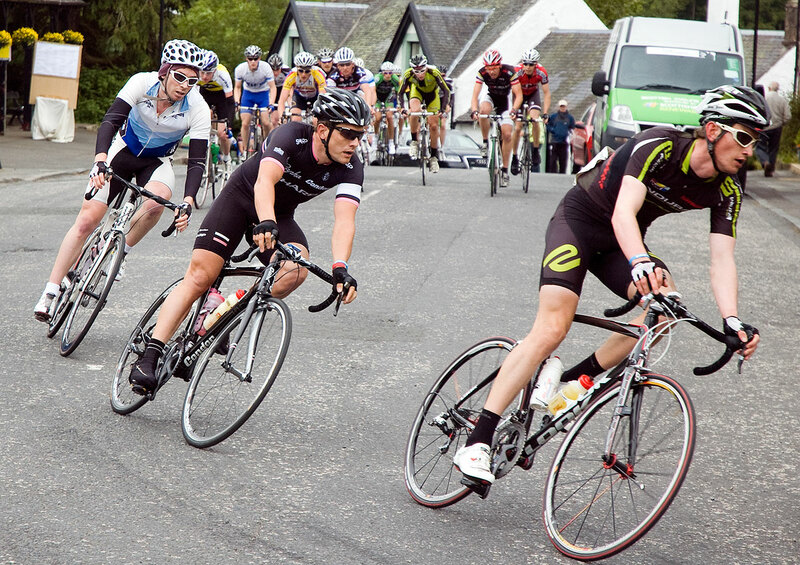 Realising their best chance lay in a setting up a sprint finish for Hawdon, Herbalife – Leisure Lakes Bikes.com neutralised the digs on the final passage of the Byne and it was a group of 14 that entered Girvan for the finishing circuit of Victory Park. A late move by two riders caused some brief nerves in the group, but on the final bend it was grouppo compacto and the assembled crowd were treated to a nail-biting sprint finish. Twenty-eight riders in total completed the 48th edition of the race run under ever-changing weather conditions and over the challenging hill roads of the Ayrshire Alps cycle park area. Andrew Sinclair of South Carrick Community Leisure was on-hand to present the winners with their trophies, and gifts from event sponsors William Grant’s & Sons. Race winner Evan Oliphant thanked the organisers and community for another great race, and remarked ‘just one more’, referring to the wins he needs in the event to match David Millar’s record of four. 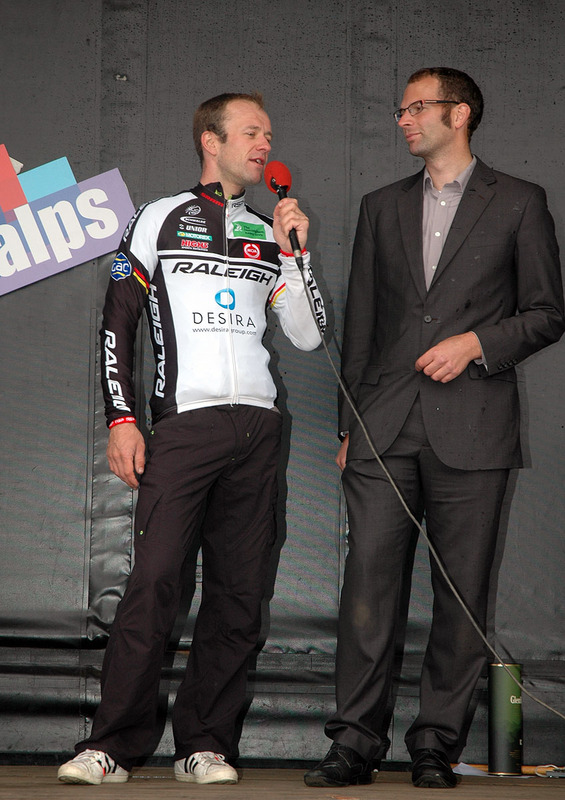 When asked about his three victories, Oliphant joked “I shouldn’t have let (then teammate) Ross Creber win in 2009 or i’d have done it already!” Oliphant lines up for the Tour of Britain next month, and will be targetting stage wins. Runner up Andrew Hawdon explained there was some confusion in his team as to the finishing position, catching up lead out man Martin Ford. “This was definitely one of the races I was targeting this season. Its been a successful day for the team, but i’m obviously disappointed to have been beaten by such a small margin”. 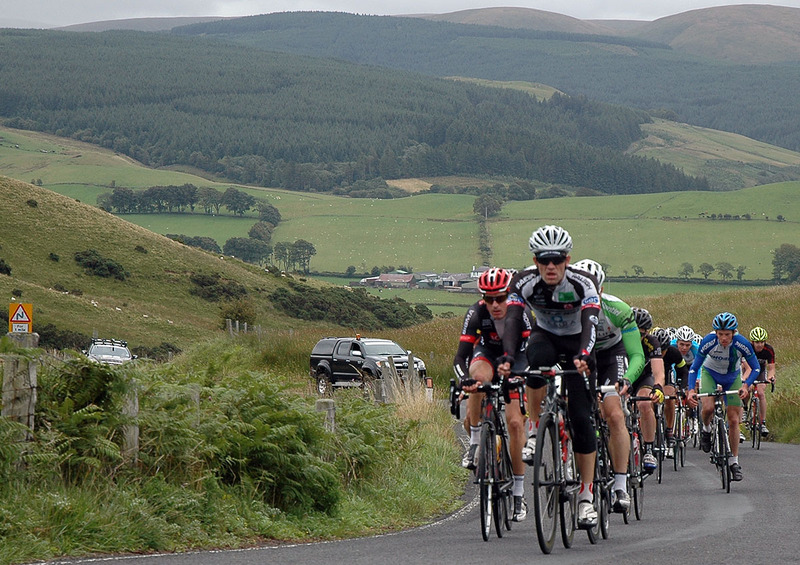 The race was the climax of the Ayrshire Alps Cycling Festival, a weekend of cycling promoted by Ayr Roads Cycling Club. 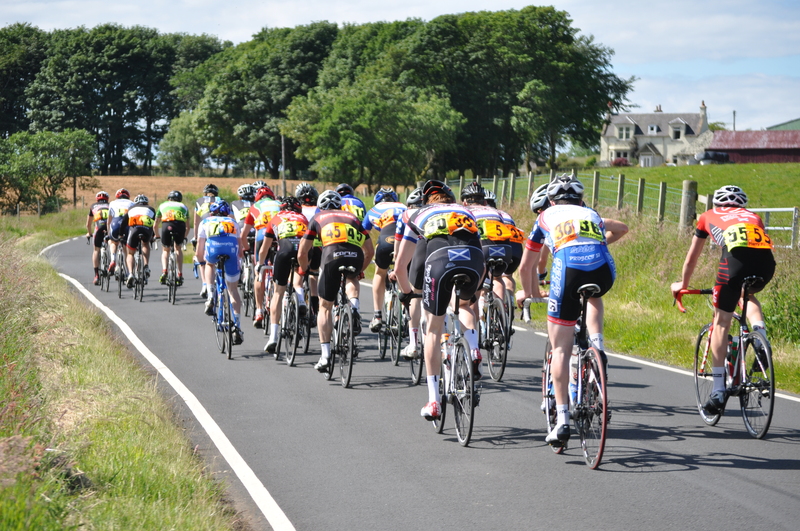 As well as the Davie Bell the club promoted the Highwayman Audax over 200km and 100km, and the SCCL Youth Criteriums. Brilliant. In the build up to promoting an event its easy to get caught up in the stress and details. However, moments like watching National Champion Ben Forsyth have to work very very very hard to deliver that awesome win on South Park Avenue remind us what all the work is for. That was truly thrilling racing! 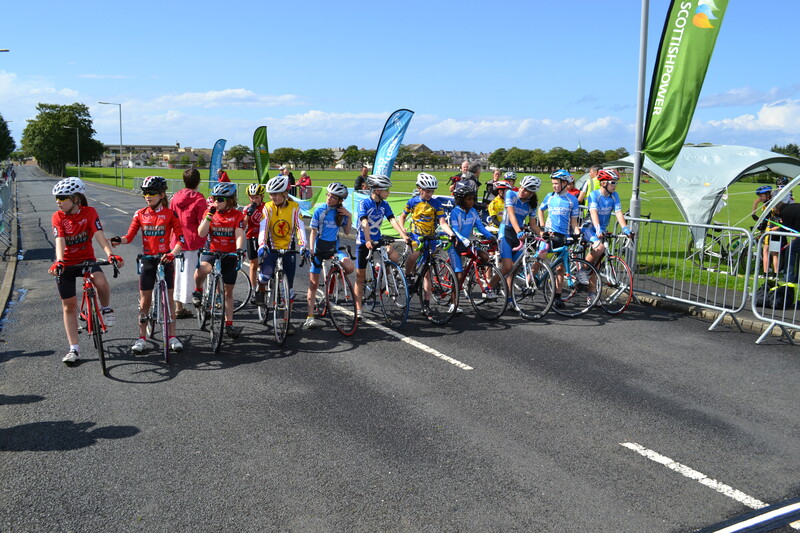 The first SCCL Youth Criterium, part of the Scottish Power Youth Series, provided a great spectacle for everyone around Victory Park in Girvan. We started with the Youth C/D events. Great to see a strong field stay together for so long, working had. The format was 25mins plus a lap. 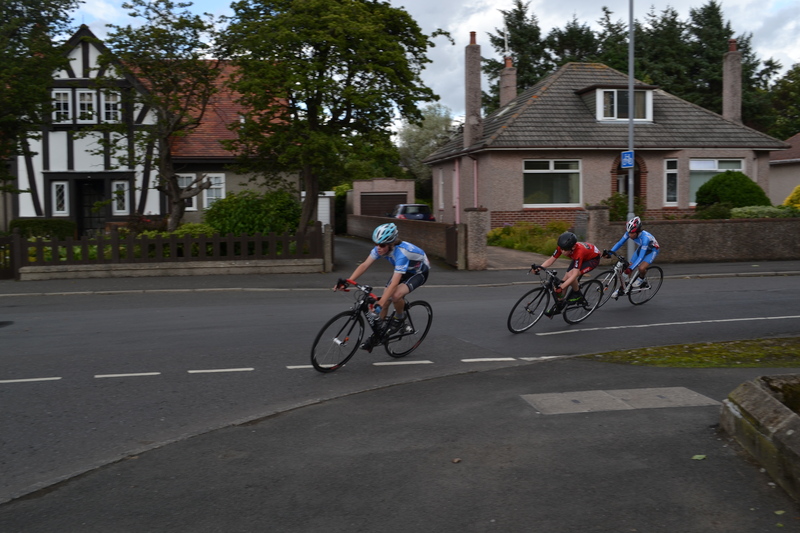 Jack Cruden eventually managed to get a gap and crossed the line a few seconds ahead of Youth D winner Callum Reid and Youth C Rider Eva Barnet. Nice work! 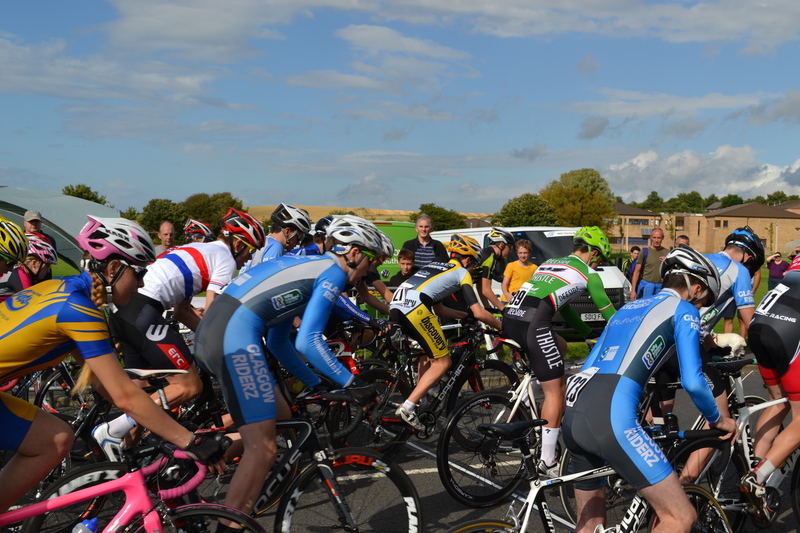 Then there was the Youth B race. Unlike the C race, this quickly became a war of attrition. Not least because of the devastating speed of Joseph Nally (Hardie Bikes). In just 11 laps he put 40 seconds into nearest challenger Sean Flynn. Local hopes were raised by young Cammie Black who delivered a fine sixth place for the new Ayr Burners Youth Cycling Club. And that just left Youth A. WHOOOSH, what a cacophony they made. Really impressive riding from a group who looked and acted the part. Really exciting watching from start to finish. Resplendent in those Blue and Red stripes, Ben Forsyth was a marked favourite. But he lived up to his reputation with a series of brutal digs early in the race. As the laps ticked by you could see him weighing up his opponents as they threw everything back at him. The finishing dual between Forsyth and Rian Hill was enthralling – a 250m straight out sprint that was in danger of requiring photo finish. A long sprint that required total commitment from both riders. Thanks for the show!